The signs of recovery seen in the final quarter of last year gathered momentum in the first three months of 2012. All sectors in the latest Automotive News Europe/PricewaterhouseCoopers Transaction Services Shareholder Value Index recorded strong gains. Manufacturers gained 27.3 percent, compared with a 3.7 percent increase in the preceding quarter. 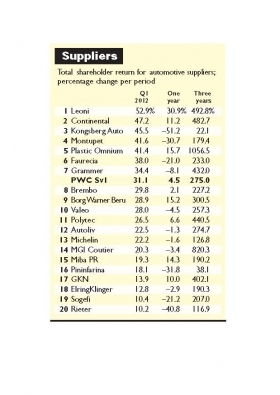 Parts suppliers improved 31.1 percent while retailers achieved a 35.2 percent increase in value compared with a 1.5 percent decline in their value to shareholders in the final quarter of 2011. These gains were significantly ahead of those in many leading European stock markets. The German DAX 30 index was up 17.8 percent while the French CAC 40 rose 8.6 percent in Q1 this year. The UK's FTSE 100 showed a 4.6 percent gain. 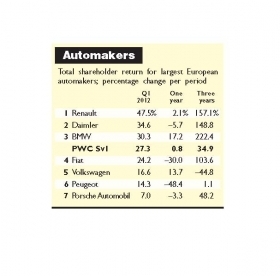 All automakers tracked by the Automotive News Europe/PricewaterhouseCoopers Transaction Services Shareholder Value Index enjoyed good growth in the first quarter. The star performer was Renault SA with a 47.5 percent jump in shareholder value, followed by Daimler, up 34.6 percent, compared to just 0.9 percent in the preceding quarter. BMW AG also showed a strong gain, up 30.3 percent. Renault is benefiting from growing investor appreciation of the likely benefits of its entry-level strategy, involving production of new low-cost Logan and Duster models. The introduction of new manufacturing capacity in Morocco, some improvement in European margins and continued contributions to profits from alliance partner Nissan have combined to increase investor confidence. BMW and Daimler's Mercedes-Benz have both enjoyed record sales in Q1, helped by exposure to growth in China, the world's largest auto market, which offset declines in Europe. BMW's sales to China in Q1 rose by 37 percent to 80,000 units. Total sales in Q1 rose 11 percent to 426,000 units, with March delivering best ever sales of 186,000 units. Mercedes also enjoyed a 12 percent rise in Q1 to 340,000 units. Volkswagen AG followed its 11.2 percent gain in Q4 with a 16.6 percent rise in Q1 this year. The only manufacturer not to record a better shareholder value growth in Q1 compared to Q4 was Porsche Automobil Holding SE, which saw its growth rate halved to 7.0 percent. The two biggest losers in Q3 and Q4 last year, Fiat S.p.A. and PSA/Peugeot-Citroen SA, both achieved strong turnarounds in the first three months of 2012. The Italian carmaker turned a 13.3 percent fall into a 24.2 percent rise. Its French counterpart, meanwhile, turned a 25.1 percent decrease in shareholder value into a 14.3 percent rise. "Although shareholder returns were strong, the winners of tomorrow continue to take shape and it is increasingly looking like there are going to be some clear losers, but not necessarily amongst the European players." said Jason Wakelam, leader of PwC UK's Automotive Transaction Services. Reflecting the good growth in automakers' values, suppliers also put in a strong performance across the board. 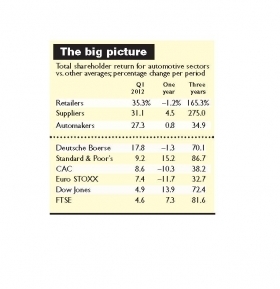 In Q4 last year, half of the suppliers in the Automotive News Europe/PricewaterhouseCoopers Transaction Services Shareholder Value Index failed to show any gains in shareholder value and the best performer, Austrian-based producer of sintered components, engine bearings and friction materials, Miba AG, only managed 19 percent. In Q1 this year, however, every supplier tracked by ANE and PwC recorded gains. Five improved by more than 40 percent and the weakest performers still came in with gains of more than 10 percent. The best performance was a 52.9 percent increase from German wiring specialist Leoni, which reported that 2011 earnings more than doubled compared with 2010. In second place was Kongsburg Auto, which turned a 40.2 percent drop in value in Q4 into a 45.5 percent gain in Q1. The Norwegian driver controls and cable specialist benefitted from recovery in the U.S. market in 2011 and stable European sales. Other big winners included German powertrain and tire manufacturer Continental AG, up 47.2 percent; Montupet, the French manufacturer of aluminum cylinder heads and other components, up 41.6 percent; and French front-end maker Plastic Omnium, up 41.4 percent. Plastic Omnium has revealed major investment plans in the area of composites, which it expects to help it increase its share of existing mature markets. These were followed by the French-based interiors and exhaust system specialist Faurecia, up 38.0 percent, and German seating firm Grammer, up 34.4 percent. The top performer in Q4, safety systems maker Autoliv, extended its 15 percent gain in that quarter with 22.5 percent growth in Q1. “Suppliers are enjoying the knock-on benefits of the growth in manufacturer shareholder value off the back of increasing volumes to the emerging markets and evidence of a recovery in the U.S.," said Jason Wakelam, leader of PwC UK's Automotive Transaction Services. 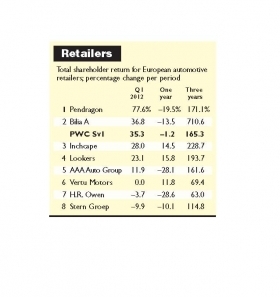 Of the three sectors that make up the Automotive News Europe/PricewaterhouseCoopers Transaction Services Shareholder Value Index. retailers showed the strongest overall gain, up 35.2 percent. That, however, was by no means the full picture. Three of the eight companies in the sector recorded declines in the quarter, compared with four in the preceding quarter. But only one company recorded declines in both quarters. The most consistent performer in the two quarters was Sweden's largest dealer group, Bilia AB, which extended a 12.6 percent rise in value in Q4 with a 36.8 percent increase in Q1. This came on the back of better-than-expected fourth-quarter earnings. Inchcape's shareholder value rose 28.0 percent in the quarter while Lookers had a 23.1 percent gain. The biggest improvement by far in Q1 came from UK dealer group Pendragon, which turned a 17 percent fall in Q4 into a 77.6 percent rise. While its 2011results were in line with expectations, efforts to secure customer loyalty for service operations are being seen to pay dividends. The top performer from Q4, the UK's Vertu Motors, was virtually unchanged in value over the first three months, while UK luxury-car specialist HR Owen followed its Q4 decline of 11.9 percent with a decline of 3.7 percent in Q1. Heading in the other direction, however, AAA Autogroup NV turned a 7.6 percent drop during the last quarter of 2011 into an 11.9 percent gain in Q1 2012 on the back of some improvements in its main eastern European markets. "Variations in the performance of retailers serve to demonstrate the importance of franchise management and having the right dealerships in the right locations," said Jason Wakelam, leader of PwC UK's Automotive Transaction Services.